ONCE there were six cinemas in the Upper Calder Valley. Now theres just one - the Picture House in Hebden Bridge. But together they provided the main entertainment for local folk, opening doors to undreamed-of glamour, excitement and exotic, faraway places. The earliest purpose-built cinema in the Upper Calder Valley was The Hippodrome, Todmorden, erected in 1908. 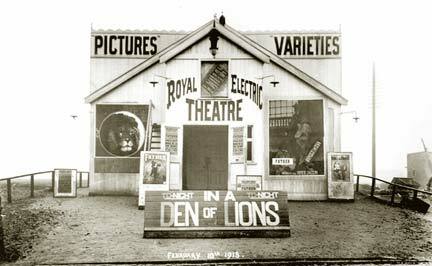 It is likely variety shows, as well as films, were shown in the early days. In 1921 owner Herbert Hartley and manager A.E. Nicholls were putting on nightly performances and were shrewd enough to ensure continuing success by installing a sound system in 1930, following the release in 1928 of the first talkie "The Singing Fool. (This revolution in film was to spell the death knell for many cinemas). The Hippodrome, however, did not survive the down-turn in cinema-going several decades later but the building itself was saved and converted into a theatre by Todmorden Amateur Operatic and Dramatic Society, who continue to use it for their productions. Messrs Hartley and Nicholls, who obviously had a keen eye for business, acquired the Olympia in Burnley Road (originally a skating rink) in 1916, only to close it 15 years later in order to make way for bigger and better things. 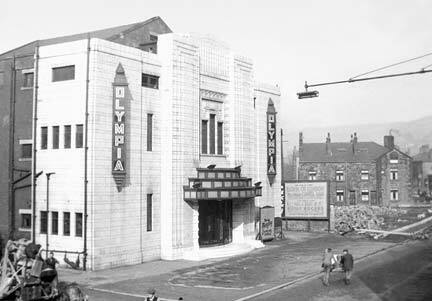 The New Olympia, built on the site and opened by the Mayor of Todmorden in 1932, was on a par with most up-to-date cinemas in any city centre, no expense having been spared to make it the last word in luxury and refinement.